Volume feeding has always presented some unique challenges. Food Warming Equipment's family of Retherm Ovens provide volume feeding results faster than ever, without overcooking or dehydration of your product. The retherm system uses full cabinet air circulation to re-heat and finish cooking of pre-cooked or prepared foods: bulk foods in trays and pans, on-site pre-packed meals, purchased meals, or any combination of the above. With easy-to-use electronic controls and the perfect balance between heat and gentle airflow, re-thermalizing a wide variety of food has never been easier! It's so simple and efficient that meal preparation can now be done virtually in minutes. The system's controls allow the operator to preset the time and temperature of the cooking cycle, as well as the holding temperature, eliminating the need for constant monitoring, just set, load, then pull product when you're ready to serve. Users can program and store up to 12 preset menu selections. The oven switches from the higher retherm temperature mode into the lower temperature holding mode automatically after the cycle has been completed. Even heat distribution allows consistent results without product rotation. Once the cabinet is preheated simply load the food, set the time and temperatures, and walk away. State of Food: Slacked vs. frozen- slacked food is food that has been defrosted to a temperature of 41°F and is recommended when retherming, as it will cut down cook time. Product Density: Products that have a higher density, or dense meal package material, both lead to longer cook times. Oven load: When there is greater space between products, better air movement is created, resulting in shorter cook times. In many respects, retherm ovens are similar in design to low temperature convection ovens. A retherm oven however, has about four times the wattage and double the air movement to increase energy transfer efficiency. Retherm units can be equipped with High Output wattage, which provides increased heat and circulation for dense or heavy-weight food products. Use of the retherm system facilitates reduced food shrinkage and increased food quality, taste and appearance. Some jurisdictions even allow the operation without the need for costly ventilation systems offering the ability to re-thermalize food in locations you wouldn't otherwise be able to (local codes prevail). With many existing kitchens, this capability opens up additional cooking capacity within limited footpints. 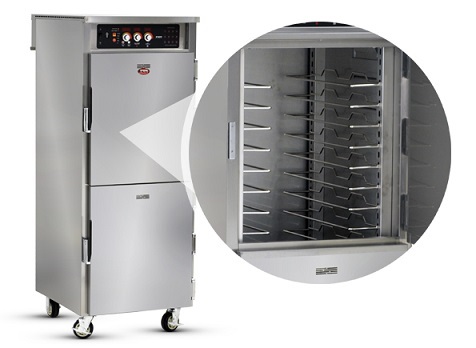 Designed to accommodate a variety of trays and pans, these extremely efficient cabinets allow venting of humidity to adjust food moisture to specific conditions. Unique tray slide design holds trays and pans by the bottom for greater support for heavy food items - tray slides are adjustable and removable for thorough interior cleaning. Retherm ovens are typically found in large institutions such as schools, healthcare and correctional facilities. Retherm ovens allow food preparation to occur off site, catering to centralized kitchens with satellite operation that have a minimum of other expensive cooking equipment, as well as associated kitchen ventilation systems. FWE's Retherm Transfer System is perfect for users who transport food from a central or commissary kitchen, or prepared earlier in their own kitchen. The transfer system begins with prepared, cooked, food. Food is either panned, for bulk service, or pre-portioned into disposable, re-heatable, sealed containers and put into wire baskets. Food would then be placed in one of two roll in racks. Pans would be loaded into FWE's RR-1220-22 roll in rack. Sealed containers would be placed into baskets; those full baskets would then be loaded into FWE's RBR-26 roll in rack. 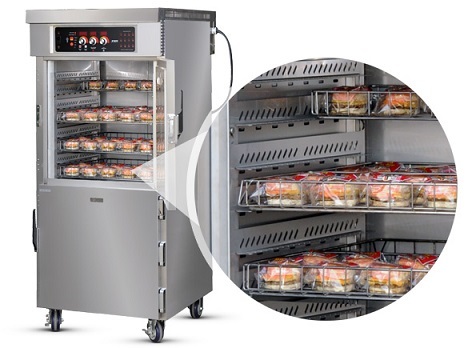 The loaded rack is then blast chilled or frozen until delivery time at individual cafeterias. Once delivered and food has been slacked, to refrigerated state, the roll in rack goes directly into FWE's retherm oven (RH-RB-26). During the retherm process, food is quickly and safely brought back up to serving temperature. Once the set temperature has been reached the retherm will automatically switch to hold mode, keeping products hot and ready until serving time. If multiple loads are required, FWE offers a heated holding cabinet (HHC-RH-26) to serve as a holding cabinet for the roll in rack, freeing up the retherm for additional batches. FWE's Retherm Ovens and System Components are built to last. FWE solid stainless steel construction is built to withstand continuous, demanding use. FWE offers a variety of features and options for our retherm ovens, to learn specifics, see literature, additional photos and get a quote, visit: www.fwe.com/products/retherm-ovens.